When Elizabeth and Neil Cameron first met Percy, they were amazed at how tiny he was. “It looked as if someone had zapped him with a movie-like shrink ray gun because he was this perfectly formed puppy but just so, so tiny,” Elizabeth says. He weighed only three-and-a-half pounds. Tears sprang to their eyes as they watched the little Boston Terrier mix play with his two sisters. They were completely smitten with the 8-week-old. 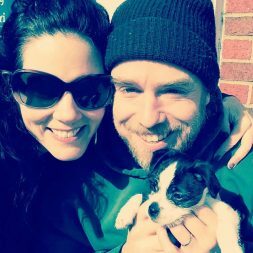 Elizabeth and Neil take their puppy home. Rescue Me Clifford, based in Paris, Illinois, had rescued Percy’s pregnant mother, and after her puppies were born and weaned, they were listed on Petfinder, where the Camerons first saw Percy. The photos couldn’t prepare them for how tiny he was, but he was just as perfect as they expected. “He was very sweet to us immediately and gave us kisses,” Elizabeth says. Their references had already been checked, and the adoption had been approved before they made the trip from their home in Massachusetts. Now they were reassured that the long journey was worth it. Percy was going to become a member of their family. The couple has a fenced yard and Percy loves to run laps. “I joke that he thinks he’s a retriever because he absolutely loves to play fetch,” Elizabeth says. After puppy kindergarten class, he advanced to therapy dog training and has recently become a registered therapy dog, who isn’t disconcerted by wheelchairs, walkers and other medical equipment. “His personality turned out to be perfect [for therapy dog work. ],” Elizabeth says. Percy’s gentle spirit brought joy to many people that day, and the Camerons are looking forward to visiting again. Their tiny dog has a big heart.